WD did everyone a favor when they reorganized their products under color-coded branding a few years ago. With the Blue (mainstream), Green (quiet and cool) and Black (performance) lines well laid out, consumers have a much easier time picking out the right drive for their application, rather than poring over spec sheets and complex model numbers. And now there's another line to add to that list: Red. Designed specfically to be used in 1-5 bay NAS devices, the Red line has hardware and software features that make it suited for that particular climate, while delivering impressive performance and reliability. WD has worked with major NAS manufacturer's to ensure compatibility with as many common NAS products as possible, and has a list of the tested devices here. 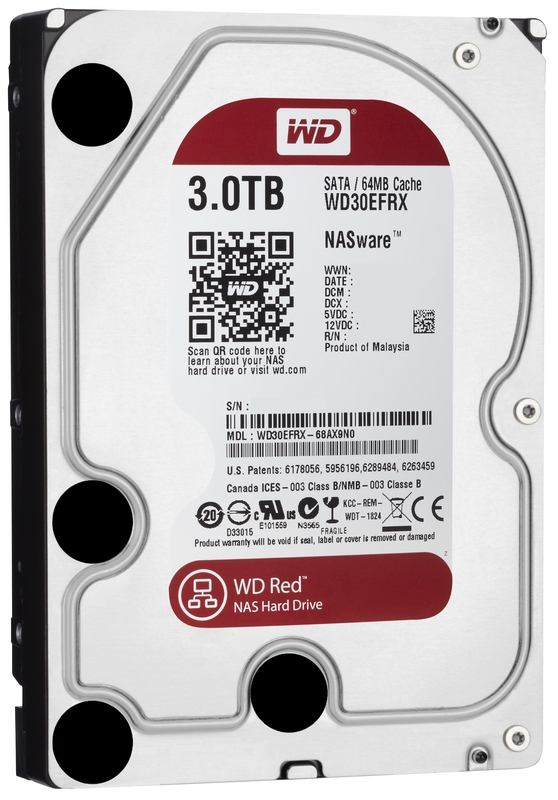 The secret sauce in these drives is the firmware, or as WD is calling it NASware. NAS devices in the home are often used for bulk storage of media, they may have some shared documents and be used as back-ups, too; but they're most often used to store movies, music and images. ATA streaming command is featured in NASware, to alter the behavior of the drive while streaming media, in an effort to ensure smooth playback, even while serving mutliple streams. They've also included error correction optimizations to prevent a drive from dropping out of a RAID array while it chases down a piece of corrupt data. The downside is that you might see an artifact on the screen briefly while streaming a movie, the upside is that you won't have playback pause for a few seconds, or for good depending on your configuration, while the drive drops off the RAID to fix the error. Then there's the matter of performance. With quoted performance of around 150 MB/s these drives are nudging into Black territory. WD's new balance mechanism contributes to this. By actively balancing the drive during use there's no need to slow the drive down to prevent damage, so performance remains high. There's also a reported power savings, which WD says will make up the price delta for these drives over the rest of the line through your power bill. Speaking of price, the MSRP for the 3.5" 1TB, 2TB and 3TB drives are $109, $139 and $189, respectively. And these drives are available at your favorite e-tailer starting today. Ganesh is patiently awaiting our review samples so he can put them through the ringer and see how they do. I have a 2-bay NAS running WD Blue in Raid 1, but they're 250GB so 250GB total space. TLER Tax describes it well. The price bump just for the privilege of the hard drive having less aggressive error recovery seems pretty absurd. I'm interested in hearing how the TLER works on these. For instance, is it situational based on ATA command, or is it always on? I'm very tempted to buy this instead of a green for a desktop data drive -- the warranty is appealing, as are the improvements to balancing & reliability. My only concern is data loss from the time-limited error recovery. Back before I knew better, I used to use a WD RE as a standalone drive, and I had TLER-related corruption problems (which is understandable, since it was designed to have a RAID controller performing error recovery for it). The marketing materials say that Red drives are supported in a 1-bay NAS, however, which suggests to me that they shouldn't have the same issues. If I understand the second paragraph the HDD can issue bad data silently for sake an uniterrupted work. So, that component has to be triggered by the application accessing the file, but it is a triggered event. So, a good scenario would be if you had two streams being sent to two different devices while another client is doing a restore from a back-up. The two streams use the ATA streaming command which triggers these different behaviors, including the error tolerance. The restore, though, is being done without that command, so normal error correction is in effect. If you have a single drive in the NAS then you might experience hangs on all three data transactions if the restore experiences an error that requires a few compute cycles. But if one of the video streams experiences an error that can't be resolved in three revolutions of the disk, then the bad data is allowed to slip through and no one gets slowed down. The frustrating thing about a lot of these standards and commands is that even if the hardware implements the solution, the software has to include it as well. And the other way around, in fact. But, have no doubt, error tolerance is a controlled variable. I'm a ZFS user, and my drives are in a raidz array. ZFS has per-block checksums, and because I've got redundancy, any failed read can quickly be recovered from (by rebuilding the data from parity and writing the block elsewhere). I would rather have the drive fail very quickly (either by passing on the bad data or presenting a read error) so that my filesystem can recover the bad data and move on.